Bloomberg has reported that Apple is planning on releasing a new 4K Apple TV in the fall. You’ll need to bring your own HDMI cable to hook up Apple TV to your TV set. Apple TV has grown up a lot since its iTV days. It’s not just for iTunes rentals anymore—Apple TV handles just about anything we watch, from House of Cards to Game of Thrones and Major League Baseball games. Since Apple opened up its tiny streaming box to developers, it’s gone from fun to indispensable. With an extensive library of apps, Siri support, and a drop-dead simple interface, Apple TV is one of the underrated players in Apple’s lineup. Just like all those years ago, it’s still the device that “completes the story” of Apple’s entertainment ecosystem, and even without some of the bells and whistles of its competitors, Apple TV is still one of the best streaming boxes you can buy. And we’ve got everything you need to know about it. Whether you’re buying your first one or just want to learn a few more tricks, make sure to bookmark our guide to Apple TV and tvOS as we keep it updated with all the latest news, features, tricks, and tips. In case you forgot, you’ll need to bring your own HDMI cable to hook up Apple TV to your TV set. Apple last updated Apple TV in 2015, and at the time, we had this to say: “AirPlay is an extremely convenient way to mirror your Mac or iOS device’s screen to your television, and Apple TV is of course the only set-top box that can play content rented or purchased from the iTunes Store.” Read our full review. Not yet. Apple last updated the Apple TV in 2015, before 4K TVs exploded, so we’ll have to wait for the fifth generation model to see if Apple jumps on the high-resolution bandwagon. 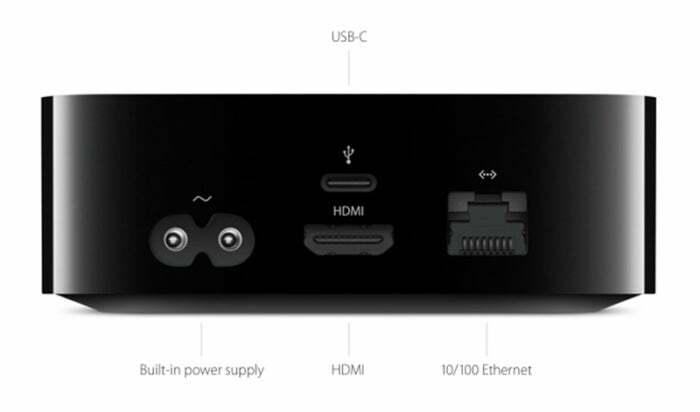 Apple TV features an HDMI 1.4 port, which is technically capable of streaming 4K content at 30fps, but rumors suggest the next model will have an HDMI 2.0 port for streaming 4K videos up to 60fps. Amazon, Roku, and Nvidia all offer 4K DMR boxes if it’s something you need to have. A dissection of an early release of the HomePod firmware (which spilled a bunch of beans about the upcoming iPhone 8) by developer Guilherme Rambo found a reference to a non-existent 4K Apple TV, suggesting that a new model could arrive sooner than later. Additionally, Bloomberg reports that Apple will release a new Apple TV this fall that can stream 4K and HDR content. The site says the new device will sport a faster processor and an updated TV app that displays live programming as well as on-demand shows. Additionally, Apple is in talks with content providers about making 4K programming available on Apple TV and will look to stream some of its own shows in the higher-resolution format as well. What about HDR and Dolby Vision? Also no. However, the HomePod firmware does include references to both HDR10 and Dolby Vision, which suggests Apple might be launching a new model soon. While Roku and Nvidia are already selling boxes that support HDR, none of their digital media streamers support Dolby Vision yet. Pretty much all you need to buy is an HDMI cable. Any one will do, so stay away from high-priced cables. Your Siri remote has a Lightning charging port, but don’t worry, you won’t need to use it very often. Why does the Siri Remote have a Lightning port? The Lightning port on the Siri Remote is for charging. Depending on how often you use it, you shouldn’t have to plug it in more often than once every few months. To check the battery level, head over to Remotes and Devices inside the Settings app, select Bluetooth, and you’ll see a battery indicator next to Remote. How do I know if I’m running the latest version? You can check for software updates by heading to the Settings app and opening the System tab. Select Software Updates and scroll up to Update Software. If an update is available, you will be prompted to download and install it. You can also choose to turn on automatic updates. I didn’t hear anything about tvOS at WWDC. Is there a new version? Yup, tvOS 11 is coming out in the fall, but it doesn’t bring any cool features like iOS 11 or macOS High Sierra. Among the usual performance enhancements, tvOS 11 features home screen sync (for keeping multiple Apple TVs organized), automatic dark and light mode switching, support for AirPods, and AirPlay 2. How is AirPlay 2 different from Airplay? The original AirPlay was essentially an easy way to get content from you iOS devices to your TV screen. With version 2, AirPlay has expanded its capabilities. You can now stream audio to multiple sources, meaning your Apple TV will act as a hub that lets you send music all throughout your house, not just your main home theater system. Additionally, your Apple TV can double as a AirPlay “speaker,” so you can send audio from your Mac or iOS device to your surround sound system with just a tap. Just like on Macs and iOS devices, Apple TV has a dedicated store for downloading and installing apps. Select the App Store icon on your home screen, and you can navigate and search for apps like you do on your other devices. And they’ll all be designed to look their best on the big screen. Is Amazon Prime Video available? Not yet, but soon. Amazon has been one of the few holdouts on tvOS, but Tim Cook announced at WWDC that the video service would finally be coming to Apple TV. No timeframe was given, but presumably it will be available around the time tvOS 11 lands in the fall. If your provider is represented, you’ll only need to sign in once and every app that requires a cable log-in will automatically be filled in with the appropriate credentials. If you’re a Comcast, Fios, Cox, or other subscriber not listed, you’ll still be able to store your username and password in Settings, but each app that requires it will still prompt you to sign in individually. Is there a post-play option like Netflix? If you’re a Netflix binger, you’re aware of the feature that lets you automatically jump to the next episode when watching a TV series. When the 4th generation of Apple TV released, it originally had a similar autoplay option, but it was removed in tvOS 10. So, if you want to sit on your couch and continuously watch a TV season purchased through iTunes, the only way to do it is to set up a playlist in iTunes and use Home Sharing to stream it. But post-play is available in the Netflix app, right? Yup. Select a TV show and it will automatically begin playing the next episode when it finishes. The TV app landed late last year as part of the tvOS 10.1 update, and it serves as a sort of smart grid for the things you’re watching (or might want to watch). Inside you’ll find links to your purchases and rentals, things you might like, and whatever you’re in the middle of watching (like the latest episode of Game of Thrones, for example). However, you won’t find any original programming from Netflix represented in the TV app. On my iPhone, TV replaces Movies and TV Shows. Why are they still on my Apple TV? On Apple TV, the TV app functions as more of a guide than a streaming platform, so you’ll be shuffled off to the appropriate app when you find something you want to watch. To play a game on your Apple TV, you can download one in the tvOS App Store. Most games use the Siri Remote as a controller, but some will require the purchase of a third-party Bluetooth gamepad. Can I still stream games from my iPhone? Yes! To turn on AirPlay Mirroring, swipe up from the bottom of the screen on your iOS device to access the Control Center, and tap the AirPlay icon to mirror the content to your screen. Then you can play the game as you normally would, using your iPhone or iPad as a controller. There’s no wake command for Siri on the Apple TV, so you’ll need to press and hold the microphone button to speak to it. When you’re done, let go of the button and it will (hopefully) carry out your request. Siri on Apple TV isn’t nearly as robust as it is on the iPhone, but it’s still a pretty useful companion. You can find content using a variety of criteria, including movie name, genre, director, or actor, and there are all sorts of things you can ask while something is streaming, such as, “What did she just say,” or “Skip ahead 10 minutes.” Additionally, you can control Apple Music, launch apps, check the weather, or get sports scores, as well as watch live content using Live Tune-in. You can find a comprehensive list of Siri commands here.